Abstractions in nature leading from the form to the formless and the statement that black is not a colour in nature created a fascination with depths and tones of black and its manifestation with different colours. 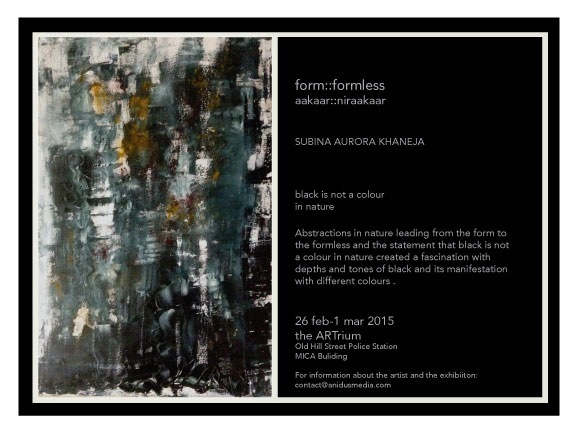 Subina Aurora Khaneja will exhibit her first solo collection at The ARTrium, Mica Building from 28 Feb to 1 Mar, 2015. “A practice of abstractions in nature started my journey in creating art and called to my need of understanding the self; and the relationship of our physical world with our inner nature. The simultaneous study of the philosophies of life through vedic and western schools of thought influences my work. I am driven by a need to explore the medium to give me answers to my question ‘Who I am’ and what is our world construct,” explains Subina Aurora Khaneja, of what drives her work. Starting with pastels initially, studying and working with oils inspired her and the potential to explore rhythms and patterns of nature with them fascinated her. Working with art teachers over the last 10 years to learn mediums and methods, she has come back a full circle to find her own voice with all their valuable insights and inputs into technique. In her oils on canvas, she explores the fluidity of the medium and her work leans towards automatism, as she tries to break beyond the conscious mind and reach that which lies beyond the self-created motivations and boundaries.